Japanese Doll Festival (Hinamatsuri), or Girls' Day, is held on March 3rd. On this day, we set up hina dolls (hina-ningyo) since they are believed to protect girls from bad luck. 1. Wet the cake pan (or line with plastic wrap). Place the crab meat Sushi rice and press down flat with a rice paddle or a spoon. Then place the white Sushi rice and the Aonori Sushi rice one after another and flatten as well. Turn the cake pan upside down onto a plate to remove the rice. 2. Make a thin ribbon of cucumber for Odairisama (prince)'s Kimono and slice the leftover into thin rounds. 3. Cut out the egg crepe and make a scepter and a fan. Thinly slice the leftover. 4. 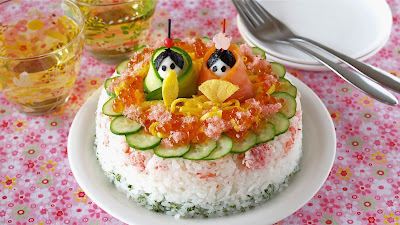 Place the cucumber slices and shredded egg crepe on the Sushi cake. Wrap the quail eggs with a cucumber ribbon (prince) and smoked salmon (princess). Let them hold the scepter (prince) and the fan (princess). Cut out Nori sheet to make their faces. Attach their hairs with bento picks. Garnish with Ikura and Sakura Denbu to finish. * お雛様 (ohinasama: princess) holds a fan called 扇子 (sensu) in both hands. * お内裏様 (odairisama: prince) holds a flat wooden scepter called 笏 (shaku) symbolic of his rank in his right hand.